The piece cites a few risks, but ultimately cheerleads for what is sure to be yet another boondoggle for hydrogen power. Again, this is all for show; a distraction from the destructive tide rippling outward from Olympic ground zero every two years. Once considered the highest of honors a metropolis could seek on the world stage, today going after an IOC bid has become controversial. Critics cite the mass purging of poor residents, uncertain investment returns, and outright militarization of public commons for months prior to, during, and after the games. During urban freeway construction in the 50’s and 60’s, it was poor communities, usually of color, who suffered the most when massive new infrastructure was rammed though. This undemocratic process of eminent domain for corporate gain is replicated for the Olympics. It’s a convenient double-plus-good for developers and their accomplices in city hall (and parasites like AirBNB) – they get to make a buck building new gentrified projects that will permanently erase the poor long after the games have concluded. Throughout Tokyo, local authorities want to revamp and redevelop just about anything they can get their hands on. It’s a mass land grab, it’s urban renewal, it’s a privatization of the commons by the wealthy. 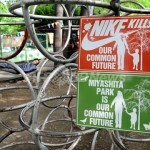 One such scheme is for Miyashita park in bustling Shibuya Ward. But it isn’t just those who depend on public parks, alleys, and overhangs for outdoor sleeping shelter at night. Cited by Agence France-Presse, some 2,000 public housing units in Shinjuku, Tokyo have been slated for eviction, and most of those residents are elderly. There grows greater understanding of the harm the Olympics imposes, along with successful urban campaigns to reject the IOC bidding process. We may see a future where the world’s greatest athletic competition returns to a singular home as it did so many centuries ago. Already there’s been talk of reducing the footprint of the Olympics, as well as the cost. Even among architects – usually not known for their concern for the poor – there are signs of reform. Edward Suzuki has suggested Tokyo mitigate harm by simply reusing its Olympic stadium from 1964. While this would seem a logical proposition, the growth for the sake of growth mentality of most urbanists will surely recoil at this. With increasing organized resistance to the IOC and its corporate partners, we may find soon that no city is willing, or even able to play host to such a colossal event. Here’s hoping we find better ways to bring the world together. Why Do Bicyclists Fear Bicycle Enthusiasm?